Manualidades por mi: Butterflies for someone special. 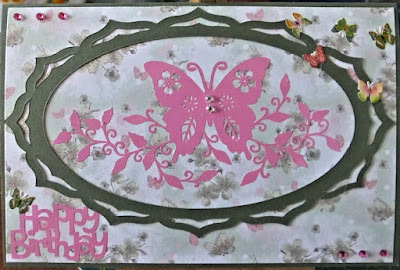 Well, despite my good intentions, I haven't managed a post again all month, but this week I need a card for my sister who will be eighty-eight at the weekend, so I decided to look at the latest Butterfly Challenge. I was pleased to see that this week's criteria is 'O' for Oval, which is my favourite shape to use for toppers. But when I also saw that it was 'O' for Olive green I wasn't so sure. Olives are on the table everywhere you go out here, and although they are not my favourite food, some of them taste OK, but believe me, they are not a pretty colour! However I raided my stash and found a snippet of backing paper printed with olive green blossom and tiny pink butterflies, so that is what I used to make this card. I do have quite a lot of plain olive green card as it is a fairly neutral colour and goes well with most things, so I made a base card from that and also cut an oval frame with my silhouette Cameo, adapting a file from my library. The main image is another cutting file purchased from the Silhouette store and cut from pink vinyl. I used the same vinyl to cut the 'Happy Birthday', another file from my library. Once assembled I added some pink gems to two of the corners, and a selection of tiny butterfly stickers bought years ago when Lakelands plastics still sold craft materials. There must have been hundreds of them in the packet, as I have often used them, and there are still lots left. So that's it. It is too hot to handle anything for long so my cards have to be fairly quick to make and assemble. So now I will pop over to Mrs A's blog to link up to The Butterfly Challenge#56, and see who else is fluttering by. This is really pretty Kate, the butterfly cutting file is beautiful. I like the oval frame as well. Great take on the challenge Kate, and a lovely card. Your butterfly cut out is gorgeous. Super card, Kate, great design. I love the oval frame you've used. what a very pretty card, and I love that wonderful oval shape. Such a super paper, and the pink is lovely. I really love those very cute little butterflies, and the main pink butterfly also is very pretty. Hi Kate, so glad you stuck with the Olive as a colour and made this lovely card for your sister. It looks fab with the pink and I do like that cutting file you have done. I don't have any Lakeland stash but do have one item from Laura Ashley from when they were doing crafting items. Thankyoy for fluttering by my challenge where your card will be entered twice into the draw. Hugs Mrs A.